With VinnPlayer you'll no longer have to access your web browser to see YouTube videos. It's a simple player, that doesn't require installation and that allows you to search and play videos from the YouTube platform. Play videos in fullscreen, create playlists with all your favorite contents and import videos from YouTube with VinnPlayer. Its interface is very clear and easy to use. VinnPlayer can come in very handy if you use YouTube to listen to your favorite songs. Because you won't have to download these songs to listen to them on your computer. From VinnPlayer you'll be able to search for the videos that you are interested in, create playlists and listen to all the songs without having to access the YouTube website. Furthermore, you'll be able to connect from VinnPlayer to your YouTube account to synchronize the playlists that you've created. 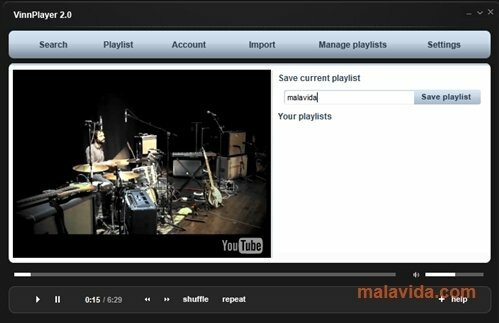 VinnPlayer is very easy to use: when you search for a video you'll see a list with the results. If you click on any of them it will be played on the interface and if you click on the video it will be played on fullscreen. To add the video to the playlist, you only have to click on the + symbol that is beside the video's name. As easy as that. If you want to play YouTube videos comfortably from your desktop, download VinnPlayer for free.